Welcome to Manistee County in West Michigan! This is where history, beauty, and nature come together to form a unique town that is a favorite destination in Michigan. Manistee has so much to offer today's traveler, and it's a terrific getaway for families or friends. Lake Michigan beckons you to its golden beaches and spectacular sunsets, a guaranteed evening event! Take a stroll on the 1.5 mile Riverwalk, which is found behind the downtown district. Mileage markers have been placed every tenth mile to gauge your distance, and it is handicap accessible with ramps on both ends of the Riverwalk. The magnificent Manistee National Forest stretches for miles and is a nature-lover's paradise. Here, wildlife is found in its natural habitat, and recreation activities include camping, hiking, and biking. Nearby scenic rivers offer opportunities to fish, canoe, or kayak. 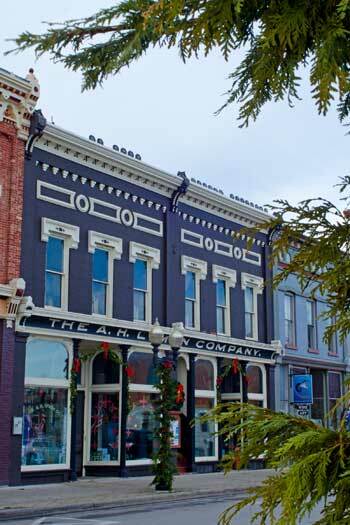 Visit downtown Manistee, known as the Victorian Port City. Spend time browsing the shopping district, which features everything from unique kitchen products to consignment items to trendy clothing. Then satisfy your hunger at one of Manistee's exceptional restaurants. Whatever you're craving, you'll find a perfect meal at an affordable price in downtown Manistee. You can appreciate the history of Manistee when you see the architecture throughout the city, especially the Ramsdell Theatre. Here is where James Earl Jones got his start, and it is still the venue for area theater productions. The newly renovated Vogue Theater is open and features current films. Built in 1938, it is a welcome addition to have this grand theater back open in Manistee. The S.S. City of Milwaukee is a 77-year old Great Lakes ship, permanently moored in Manistee. It is open for tours, and during October, transforms into a Ghost Ship for the Halloween season. Numerous golf courses, Casino Gaming, and the friendly faces of residents and business owners give Manistee the distinction of being in a place where you truly feel welcome. Discover the fun and beauty of Michigan's destination Victorian Port City, Manistee. Any season--any time--Manistee is a great place to be. We have listed our area events in our festivals & events story so you can see at a glance what's happening when. You can get event details by checking our calendar of events pages and selecting a specific month. There's always something fun going on, no matter what time of year. You'll never be bored in Manistee! When you visit a community away from home, it's typical to find yourself eating out, shopping, or looking for things to do. Manistee merchants are happy to serve you with a smile! So, browse at our specialty stores in downtown Manistee or nearby. Relax, and enjoy a meal at a local restaurant. Discover the many businesses ready to entertain you, or to provide you with a variety of services. Manistee is also along the route of the Lake Michigan Circle Tour.